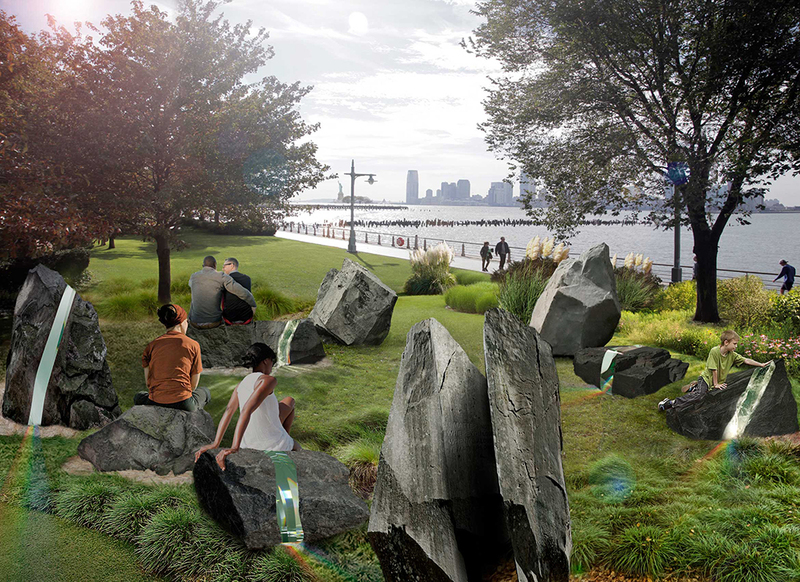 A monument to the LGBTQI community is expected to be completed this June along Hudson River Park. The anticipated unveiling coincides with Pride month, which celebrates the 1969 Stonewall uprising that took place just half a mile away. The monument, designed by Brooklyn-based artist Anthony Goicolea, is an arrangement of nine boulders that have been incised with glass prisms that display the rainbow when lit. The project was in part spurred on by the Pulse nightclub shooting in Orlando that left 49 dead which motivated Governor Andrew Cuomo to appoint an LGBT Memorial Commission. While a celebration of the present queer community, the monument’s site is also a testament to LGBTQI history near both the thriving gayborhood of the West Village and the West Side Piers, which in New York’s history served as a gay meeting (and cruising) ground. It is also not far from the 2016 New York City AIDS Memorial, which is dedicated to the over 100,000 New Yorkers who have died from AIDS-related illnesses and the many who acted as caregivers during the crisis and who continue to fight as activists.